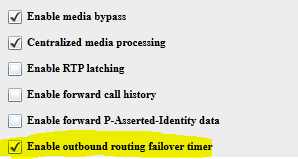 last week I had an annoying problem with Exchange, Lync and PSTN, when a user have simultaneous ringing enabled to his/her mobile number and they don’t answer the call, the call get disconnected or get forwarded to the Cell network Voicemail instead of Exchange Voicemail. then I start looking on the voice policies settings, noticed another problem, the “Voicemail escape timer” is disabled on the voice policy. what is Voicemail escape timer? I’m glad you asked, this feature allows the Lync to route the call to the Exchange Voicemail when the PSTN number you have for simultaneous ringing is switched off, out of network coverage and try to take the call to its voicemail. 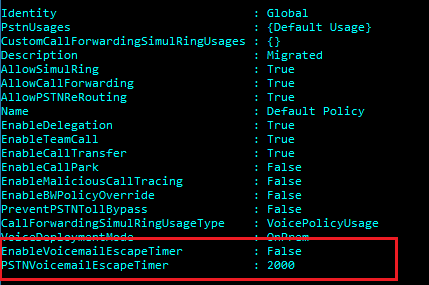 so when enabling this escape timer, the call will keep ring on your Lync client then will be routed to the Exchange Voicemail. after waiting for 10 minutes and trying again, the call was forwarded to the Voicemail of Exchange.